Met up with Melanie and Michelle on an overcast Sunday afternoon, only to have the skies part right as our senior portrait photoshoot had commenced -- how fortunate we were! 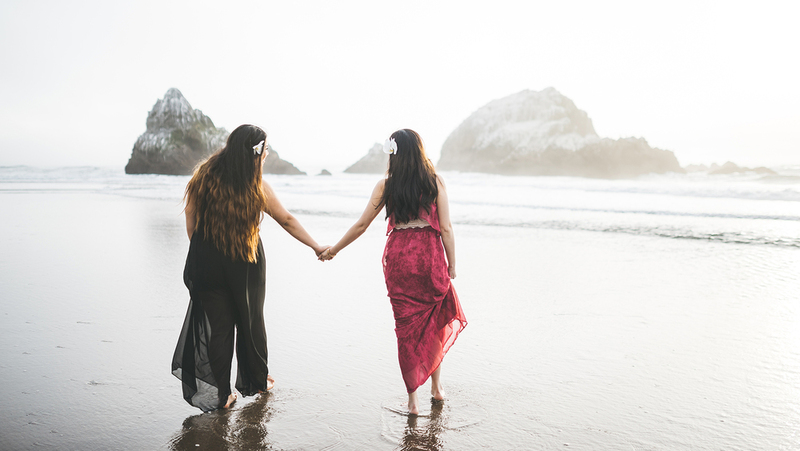 Because most students typically choose to have their graduation photos taken at either their respective school campus or the Golden Gate Bridge, Melanie and Michelle decided to go for the Embarcadero this time around. While the Embarcadero is still a very touristy and sought-after location, it's surely a lot more low-key than the Golden Gate Bridge (or even the Bay Bridge, at that) for photos, and definitely allowed their photos to stand out from what people are typically used to seeing. One thing I truly enjoy about portraiture is the fact that an otherwise "common" or "cliche" photo location can instantly become that much more interesting whenever it's not intended as the main focal point in an image. Melanie and Michelle definitely have bright futures ahead of them, and I wish them both an early congratulations for graduating from the University of San Francisco with their Bachelor's degrees one semester early! Sometimes even in seemingly undesirable photographic conditions, one's attitude can truly make or break the quality of the images they take. Met up with Anessa on a busy Monday afternoon at USF's campus, ready for senior portraits, despite having to reschedule two times due to weather complications. This time around, it was cloudy out (and had just rained a few hours prior), but we decided to stay optimistic and take advantage of the nice, cloud-diffused lighting as much as we could. To our surprise, towards the end of the photoshoot, over at Gleeson Lawn (right by USF's iconic Saint Ignatius church), the sun began to peak out a bit and gave a nice backlight to Anessa's silhouette, allowing for some interesting compositions with nicely-lit backgrounds. Special thanks to Morgan & Carlo for the referral, because if it wasn't for their couple session a couple of weeks back, Anessa & I probably wouldn't have had the opportunity to shoot together! Met up with my good friends Jay, Ary, and Jenn at the San Francisco Palace of Fine Arts on a slightly overcast day for my first ever triple-senior portrait session! To our luck, the overcast weather provided us with nice, soft light that made for lovely portraits. During the photoshoot, some bits and pieces of sunlight also ended up breaking through the clouds every so often, creating interesting lighting effects in the background. Top the shoot off with a fun little sparkling cider toast, and it's no doubt that a celebration is definitely in order for completing their undergraduate careers at USF! Met up with Rhonda and her sister, Courtney, for a quick little senior portrait session at USF! Rhonda will be receiving her undergraduate degree at USF, while Courtney will be graduating with a masters from UC Irvine - she was visiting Rhonda for just the weekend, so things worked out rather perfectly as far as scheduling a portrait session was concerned! After shooting around USF's campus, we also decided to head over to Sutro Baths to grab some shots by the coast, as they are both also very influenced by Hawaiian/islander culture. Congratulations, Rhonda and Courtney!